While there is a superb body of highly specialized literature available on various aspects of stamp collecting, there is no resource that encompasses all of the many facets of U.S. stamp collecting; the Encyclopedia fills that void. Collecting U.S. stamps involves one in history, politics, production and technology, design, searches and detective work, and discovery. The collector learns about culture and institutions, geography and the arts, and many people whose visions shaped our country. 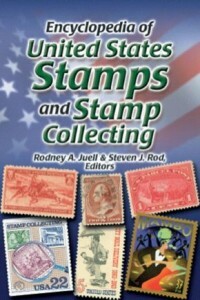 As you look at the Table of Contents you will see the broad range of U.S. stamps covered in this book. You will also note chapters devoted to history, production, technology, and research that will help make you a more informed collector. Each chapter employs a similar format, beginning with an introductory text providing an overview. Stamps and covers may be illustrated in other than actual size. Occasional “side-bars”, in tan shaded boxes, explore some aspect of the story. 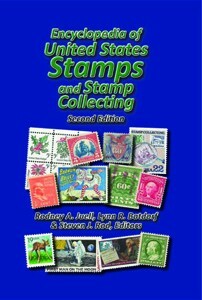 The introductory text is followed by “Notes on Collecting” which contains advice on collecting the stamps or subject matter under consideration. Next is the “Almanac” which provides a chronological reference for the topic. Following this is “What Others Have Said”, which presents the topic the way others have seen and understood it in the past, while also providing a sampling of the vast array of literature available to the serious U.S. stamp collector. Attribution of these quotes is abbreviated. The full reference for each is found in Appendix B – Print Resources. Next will generally be provided some examples of typical usage of this material. The majority of items illustrated are easily obtainable from a stamp dealer or local bourse. Finally, “Where to Find More Information” suggests resources for further study. Full citations for these sources appear in Appendix B – Print Resources. Many of these are available from dealers in philatelic literature. For collectors new to the hobby, this book is an introduction to the many aspects of U.S. stamp collecting. For the experienced collector, many of the chapters may incite curiosity about a previously unexplored facet of the hobby. For all readers, we trust this book will educate, entertain, and inspire you as a U.S. philatelist. The Encyclopedia of United States Stamps and Stamp Collecting introduces the reader to the full scope of United States stamps and stamp collecting. Beginning with an introduction to “stampless covers” (letters mailed before the introduction of postage stamps), it then introduces the many stamps issued from their inception with the 1845 Postmasters’ Provisionals through the stamps of the early 21st century. Other chapters deal with the host of stamps known to collectors as “back-of-the-book” issues, including stamps issued for air mail, special delivery, U.S. possessions, revenue purposes, and postal stationery. The history of the Postal Service and the various stamp printers, including the Bureau of Engraving and Printing is explored. A section of the Encyclopedia highlights the technological innovations of stamp production, the history of the movement of the mails, markings applied to envelopes, and meters and machine generated postage. While a book about U.S. stamps and stamp collecting, in a larger sense it is a history of American politics, culture, values and technology seen through the prism of the nation’s postage stamps and postal service. Errata updated May. 8, 2008. Page 702, the Scott number in the last line should be 1036b. Page 367, Figure 9, the last date in the caption should be December 13, 1941.
those numbers beginning with “S” were printed by Sennett, with “A” by American Banknote Company, with “V” by Avery Dennison. term “penny post card”. The rate was finally raised to 2¢ on January 1, 1952.